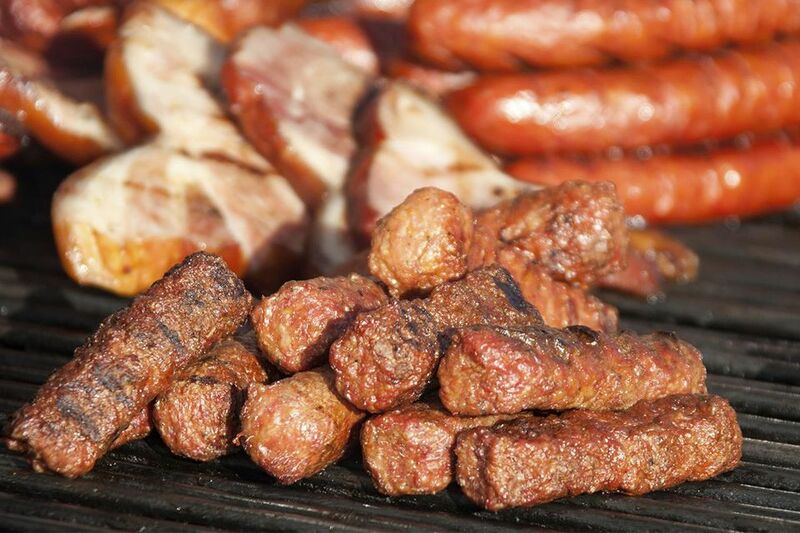 Mititei is a Romanian sausage usually made with beef, pork, and mutton; although I've made them with pure beef, pure lamb, half and half beef and lamb, beef and pork, or lamb and pork. They're not enclosed in casings but are instead shaped into sausage-style rolls, chilled for two to eight hours, and then grilled. Traditionally mitiei are served with mustard and beer. (Larger image.) Serves 2. In a large bowl, mix all ingredients together with your hands, squeezing and kneading to combine thoroughly. Pinch off a small piece, fry it, and taste to adjust seasonings. Form mixture into 4 sausage-shaped rolls about 1 inch in diameter and 4 to five inches long. Arrange on a lightly oiled platter or large plate, cover with plastic, and refrigerate for 2 to 8 hours. Build a hot fire, oil the grate, and cook, turning with a spatula, until browned and cooked through; 6 to 8 minutes. Serve immediately with mustard.